class="post-template-default single single-post postid-338214 single-format-standard custom-background group-blog header-image full-width singular wpb-js-composer js-comp-ver-5.7 vc_responsive"
The GROW Nebraska store in Kearney’s Hilltop Mall is moving to a new location. It will open at the former site of Mac’s Creek Wine Bar on Talmadge Road on Monday, Oct. 1. Pictured from left are GROW Nebraska staff members: Business Development Specialist Kristi Gargan, IT/Development Coordinator Cammie Kroll, CEO Janell Anderson Ehrke, Market Access Coordinator Crystal McKillip and Accounting Coordinator Peggy Nagy. 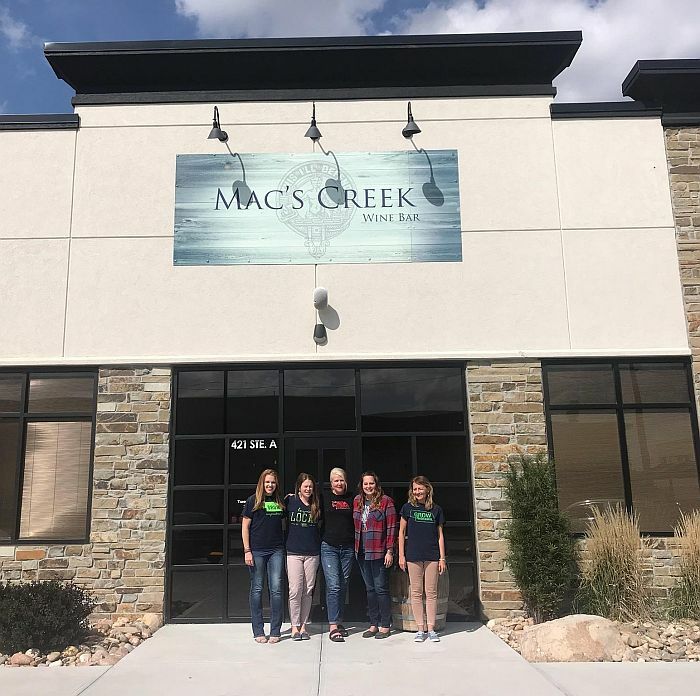 KEARNEY – The GROW Nebraska store in Kearney’s Hilltop Mall is moving to the Younes campus in the space formerly occupied by Mac’s Creek Wine Bar in Kearney. The GROW store officially opens at the new location at 421 W. Talmadge Road No. 1 on Monday, October 1. “We are excited about this new location close to the interstate and the new traffic it will bring to our store,” GROW Nebraska CEO Janell Anderson Ehrke said. The GROW Nebraska store features more than 3,000 products created by 288 Nebraska entrepreneurs. Products range from t-shirts and books to lotions and barbecue sauces. Top-selling products at the store are Big Red Popcorn on the cob, Great Plains Honey Farm Kettle Corn, Preferred Popcorn (Cheese), Rowdy’s Hard Tack Jerky and Hilger’s Agri-Natural Hulles Gourmet Popcorn. The store serves as a showcase of products made by some of GROW’s 400 plus members. It has been located at the Hilltop Mall since 2005. With the move, the GROW Nebraska store is changing its name to BUY Nebraska to coincide with the organization’s online shopping site www.buynebraska.com that features more than 3,500 made-in-Nebraska products. The move will also allow GROW Nebraska to create a dedicated space for its new Innovation Center that will provide onsite training and education for members. The GROW Nebraska Innovation Center is made possible through a grant from the Peter Kiewit Foundation. Paul Younes, president of Younes Hospitality, said the location should be a great match for GROW Nebraska. With the continuing addition of new restaurants and hotels in south Kearney, Younes said the new location will give GROW Nebraska more exposure and new customers. “Here, they can expand their market with people from all across the state and people driving across the country on the interstate,” Younes said. GROW Board Member President Rodney Whipple of Arapahoe said he also is excited about the new exposure this move will bring to members’ products. The store will be open from 8:30 a.m. to 8 p.m. Monday through Saturday and from 11 a.m.-6 p.m. on Sundays. GROW Nebraska is an educational non-profit organization headquartered in Oxford that empowers entrepreneurs through business training, technical assistance, promotion and market opportunities. It provides education and training to individuals and small business owners across Nebraska, with an emphasis on economically depressed areas, to create sustainable economic development and marketing opportunities. GROW is celebrating its 20th anniversary in 2018.